I recently presented to my teachers ideas for teaching the War Chapters. While giving lesson ideas, I wanted to demonstrate how quickly you could go to some key verses, give a good “Look for”, follow up with good questions, and then have the students come up with good “Take Aways” that you hope would stick with them. The text in Red is what I might invite them to write in their own scriptures. Short and sweet. 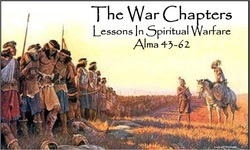 Remember the key to teaching the War Chapters is after talking about their literal warfare, ask what it teaches about our “spiritual warfare” we are engaged in each day. Hope this is helpful. I am sending this as a PDF rather than a PowerPoint because of size. Also, there is nothing here which would require you to use a PowerPoint or projector. I just used this in the Inservice so we would not spend so much time turning to the key sets of verses.